There is a popular belief in France that nectarines and their cousins, brugnons, are combinations of peaches and other fruits such as plums and apricots. Jean Michel was quite adamant before I was able to prove the contrary. He even flatly refused to accept the definition in the Larousse dictionary but he says that he has always been told that they were a hybrid. 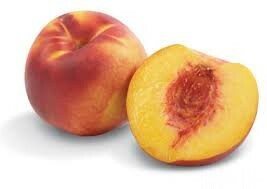 The Larousse dictionary says that a nectarine is a peach with a smooth skin whose stone does not adhere to the flesh. A brugnon is a variety of peach with a smooth skin whose stone adheres to the flesh. My personal experience is that nectarines have a yellowish-orange flesh and are sweeter than brugnons whose flesh is pale and tastes a bit tart. I don’t actually like peaches because of their fuzzy skin but I can eat nectarines if there isn’t anything else. The adherence/non adherence of the pit has given the terms “clingstone” and “freestone” in English. It’s the wrong time of year to be able to use one of my own photos so I’m borrowing them from Wikipedia. So where do the words pêche, peach, nectarine and brugnon come from? Peach (and pêche) come from Old French pesche meaning “peach, peach tree” (Old North French peske), and directly from Medieval Latin pesca, from Late Latin pessica, a variant of persica “peach, peach tree,” from Latin malum Persicum, literally “Persian apple,” translating Greek Persikon malon, from Persis “Persia”. In ancient Greek Persikos could mean “Persian” or “the peach.” The tree is native to China, but reached Europe via Persia. By 1663 William Penn observed peaches in cultivation on American plantations. Its meaning in English of “attractive woman” is attested from 1754; that of “good person” from 1904. Peaches and cream in reference to a type of complexion is from 1901. Pêche in French does not have any of these meanings. The most common metaphorical meaning is avoir la pêche which means to be full of beans or in top form. The word nectarine dates from the 1660s and means “of or like nectar”. It was probably inspired by German nektarpfirsich “nectar-peach.” It first appeared in English as nectrine before becoming nectarine. Brugnon, on the other hand, is borrowed from the Occitan (southern French) prunhon from vulgar Latin “prunea” meaning plum. It first appeared in French as brignon (1600) then brugnon (1680). Maybe its origin partly explains the hybrid belief I mentioned earlier. In the middle of the 19th century, brugnon was used for all smooth peaches and the stone-adhering/non-adhering was introduced later on. Did you know about the brugnon/nectarine hybrid belief? This entry was posted in Food, French language. Bookmark the permalink. Yes I’ve heard the hybrid idea before. I have both brugnons and nectarines in the orchard. 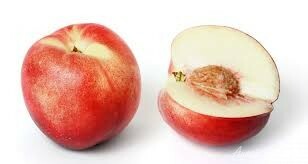 The nectarines are white fleshed, the brugnons yellow fleshed (so the opposite of your experience :-)). There is no distinction in English for brugnons, except to spell it out by calling them cling-stone nectarines. That’s strange about the colour. I’m going to ask the people at the market tomorrow what they think! I didn’t know. I’ve never had nectarine. Really? There are no nectarines in your neck of the woods? White fleshed nectarines have come on the market more recently here. Are they then a hybrid? I had never imagined that they would be a hybrid of the peach or plum. We now have smoothed skinned peaches, but I prefer nectarines. Because of cold storage, one is often disappointed on the first bite. No, it’s not a hybrid. It’s just a variety of peach. I guess most of Australia’s stone fruit was originally imported. No, I didn’t know of the belief but it it exactly these sort of (mis)understandings that can trip me up linguistically. I just thought that peaches were fuzzy and nectarines were not. The use of ‘cling peaches’ , that I have seen as tinned way back in the day, now takes on a meaning of the ease of stone removal. Fascinating! And I just googled it and got “There are two categories of peach, Clingstone and Freestone, distinguished by the ease with which the edible area pulls away from the stone (pit)”. Bravo Lesley! Cling peaches – I never thought about what that could mean before. You’re so right. I’m going to add it to the post.